An ingenious Canadian farm equipment manufacturer has a tree-spade on offer that can gently up-root grown trees for transplanting. I had no idea that this was even an option and ought to be a mandated part of any new construction project—saddening to think that the pace of sprawl overtook our abilities to mechanise silviculture (except for the felling bit) so quickly and without a glance over our collective shoulder. 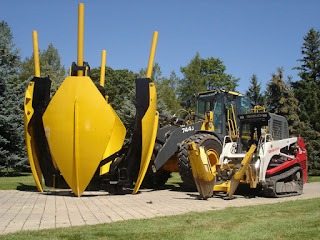 Go to the link to see a video demonstration of these amazing machines from Dutchman in action.